Located 28 kilometres south-west of the Mount Gibson Homestead. The station is now a privately owned nature reserve. 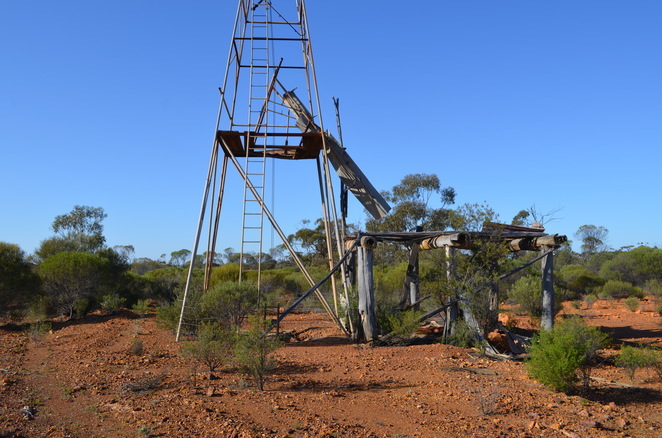 Two hundred metres south-east of the mining camp is a historic shaft with a termite ridden headframe. This is called Tobias Find mined sometime between 1910 to 1916, but gold production from it was not significant. In modern times the deposit was discovered by Reynolds Metals Australia Ltd in 1983, and subsequently mined from 1986 producing 1 g/t Au. The mine closed in 2006, and was owned at that stage by Legend Mining. There are 8 pits running north-south for 6 kilometres called Enterprise, Donkey D, Orion, Orion North, Wombat, Deep South, Hornet and Orion 2. Further, the small Highway Pit is a few kilometres to the north-west. 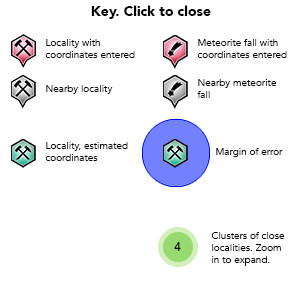 The ore is found beneath a laterite bedrock revealing supergene oxide and sulphide zones in the first six locations, and primary Au-Ag in the last two. The deposits are located in the Retaliation Belt, the southern portion of the Yalgoo-Singleton Greenstone Belt. This is composed of Archaean metavolcanics and intrusive felsic rocks and shearing which has been metamorphosed to mid amphibolite facies. The mineralisation is hosted in the Mt Gibson Shear Zone, 1 kilometre wide, striking north north-east, and dipping steeply to the west. This is a shear network composed of a rock called a mine sequence, dominated by variably differentiated tholeiitic metabasalt and metadolerites, with lesser magnesium metabasalts and quartz feldspar porphyries. The mine sequence hosts the gold consisting of steeply dipping lenses of sulphide bearing schist, predominantly within quartz-biotite and altered chlorite mafic rocks. 1) spessartine/almandine garnet/gahnite, and cordierite-muscovite bearing schists, forming a coherent strataform horizon overlying the main ore zone, associated with sphaletite-galena-pyrite with lesser pyrrhotite-chalcopyrite and tetrahedrite. It is an unusual assemblage to find gold. 2) a more typical metamorphic sheared quartz-biotite and sulphide altered envelope associated with pyrrhotite-pyrite and chalcopyrite. Free gold is rare. There is a strong relationship between high grades of gold with the pyrrhotite-pyrite-chalcopyrite assemblage, suggesting gold was formed during the event which created these minerals. At the Enterprise Pit there is a gold bearing bedrock with quartz veining in sheared metabasalts with mixed sulphides of pyrites, pyrrhotite, chalcopyrite, sphalerite and galena. This is overlain by twenty metres of bleached saprolite consisting of white kaolinised clays and associated green smectitic clays with quartz veins up to one metre thick, and rare ferruginous basic dykes. This in turn is overlain by ferricrete consisting of hematite, kaolin, quartz and goethite. Above this is 3 to 4 metres sandy clay, and the top 1 metre a hardpan with thin coatings of Mn oxide.